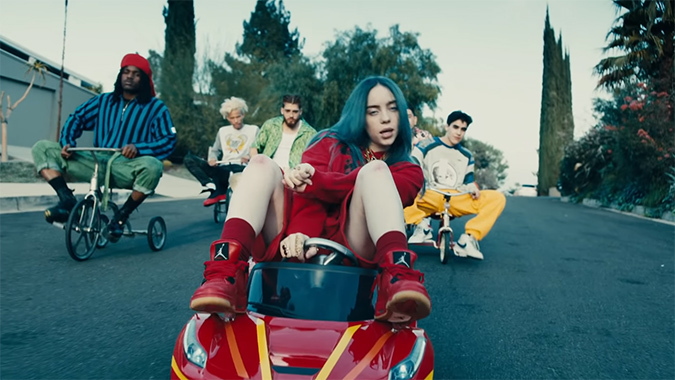 There are songs throughout Billie Eilish’s debut album When We All Fall Asleep, Where Do We Go? that haunt you in a way that’s painfully relatable. “I’m not okay, I feel so scattered,” she sings in “listen before i go,” a harrowing song that warps the lyrics of a love song into something far worse. Eilish has the sort of anxieties and regrets that many of us have, despite being pretty young. Much of the album feels like the kind of stuff you’d type about, late at night, in text messages with your best friends. Her lyrics are muted and sharp, but animated with her dreary vocal style. Nothing is as curt as it sounds when Eilish stretches syllables over the pianos and dull beats in many of the songs. It’s hard not to imagine her music videos that dwell in the uncanny and violent while you listen to this album. When she’s looping through “My doctors can’t explain / My symptoms or my pain ” in “my strange addiction” you imagine her writhing around in a stark white hospital bed or something equally unnerving. Eilish has created a texture for her music and her persona, a mood that permeates this album. Except that persona is inherently young. In “wish you were gay” Eilish talks about a boy that won’t reciprocate her affection. “Don’t say I’m not your type / Just say I’m not your preferred sexual orientation” she writes. In a Instagram post, she said “It literally means I wish he was gay so that he didn’t like me for an actual reason.” Eilish’s explanation selfishly reduces a part of someone’s identity as a flaw–something that someone with a lack of life experience might say in private DMs with a friend. It’s a song that that disregards other people’s experiences as if Eilish never really deeply considered what she was really saying here. It stands oddly against the amount of personal reflection and worries about how other people think that fuel the rest of the album. And that’s the thing I can’t stop thinking about while listening to When We All Fall Asleep. It’s both an album that feels true, but also inexperienced. There’s a song with goofy clips from The Office next to a song that’s about feeling invisible to someone you love. The album is about the frustrating distance in relationships and about making ’em bow to Eilish’s rapid popularity. It feels young because it’s confusing. It’s cocky and damaged; it’s bumpy and barren. It’s not always easy to tell which songs are for fun and which songs are for real. And maybe that’s the point. Filed Under: Billie Eilish, Music, When We All Fall Asleep Where Do We Go?